A recent bag on the right and one of the very first bags Western Mountaineering produced on the left – made in 1970 or 1971. Camping in February means eleven hours in a sleeping bag every night. Who makes that sleeping bag can make the difference between embracing adventure during the coldest, darkest, quietest months or shunning it. High-quality gear allows you to push further and love being outside in any season under any conditions. 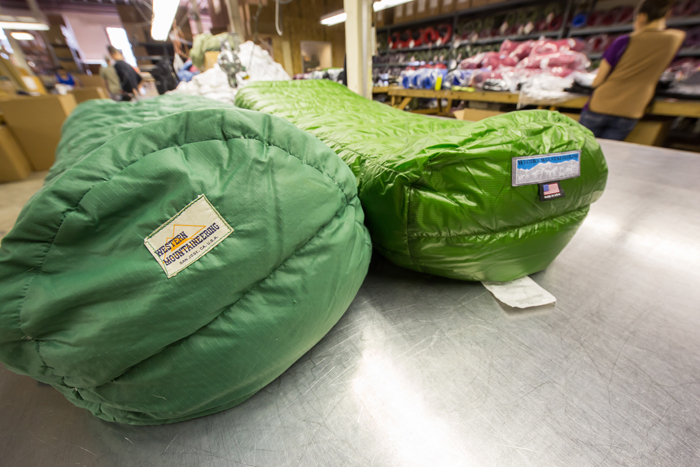 That’s why it’s good news that some of the warmest and lightest sleeping bags in the world are manufactured in the South Bay Area. If you want to explore new horizons and accept new challenges in the outdoors this winter, Western Mountaineering gear can make it a more pleasant experience. Since 1970, Western Mountaineering has set the industry standard for warm, light, reliable sleeping bags and down garments. They manufacture three dozen different bags, from the summer Everlite, which weighs less than a pound to the Bison Expedition bag, which features a Gore Windstopper fabric and will keep you toasty when the temperature dips to 40 below. Their down jackets, vests, pants, and booties are designed for any activity from kicking around a chilly cabin to scaling Denali. 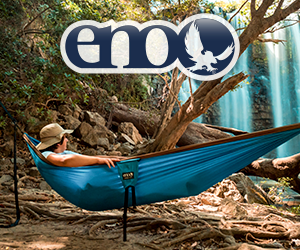 Half their sales are domestic and half their sales go to outdoor enthusiasts from Norway to South Korea. Germany accounts for 17% of their total business; if Germans think it’s well engineered and constructed, it probably is. “Down is still the warmest, lightest, most compressible material on earth,” says Western Mountaineering co-founder Gary Schaezlein. “It still stands up to any synthetics.” Western Mountaineering does not rebrand their gear every year. Instead they quietly innovate, and continue to make the high-quality gear their faithful customers have come to rely on. Schaezlein and his co-founder Jeff Jones started the company to make expedition gear they couldn’t find elsewhere. 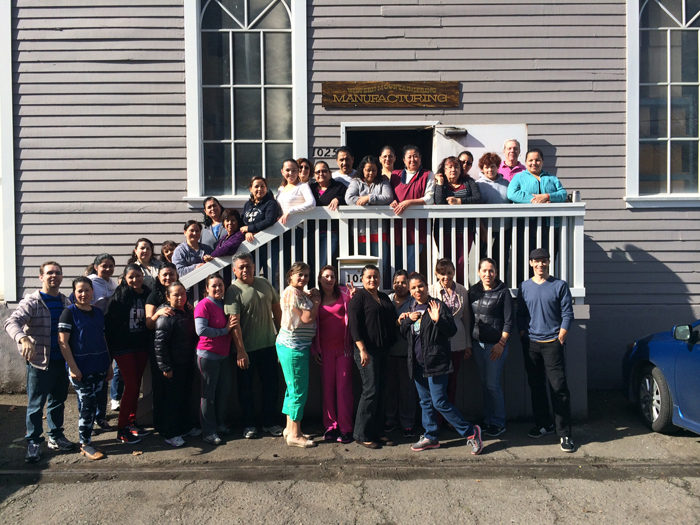 Their first factory was in a 2-story building on 1st Street in San Jose. Manufacturing took place downstairs, with retail upstairs; customers walked past humming sewing machines to browse sleeping bags, clothing, backpacks and even dogpacks. Jones and Schaezlein parted ways in the mid-80s. Jones took over the retail end and Schaezlein took on manufacturing. Jones eventually sold his business, but Schaezlein continues to make gear. The company has grown to about 50 employees and after an initial spurt continues to grow at about 5% a year. Full disclosure: I’m on my second Antelope Western Mountaineering bag. It’s kept me warm at five below (I used a vapor barrier liner), has a weather resistant breathable shell and weighs less than two and a half pounds. My first one gave up the ghost after about 700 days of abuse. Gary Peterson, Western Mountaineering’s Managing Director, insists it should have lasted longer. “With a little TLC, our bags should last 1,000-1,500 nights.” I’m embarrassed to admit what I put my bag through, but I accept full responsibility for its untimely demise. I’ve dallied with cheaper, inferior brands but ultimately I returned to Western Mountaineering. The Antelope is the best sleeping bag I’ve ever owned, and right now I have a quiver of half a dozen. So I was already a fan before I journeyed to San Jose to see their factory first hand. 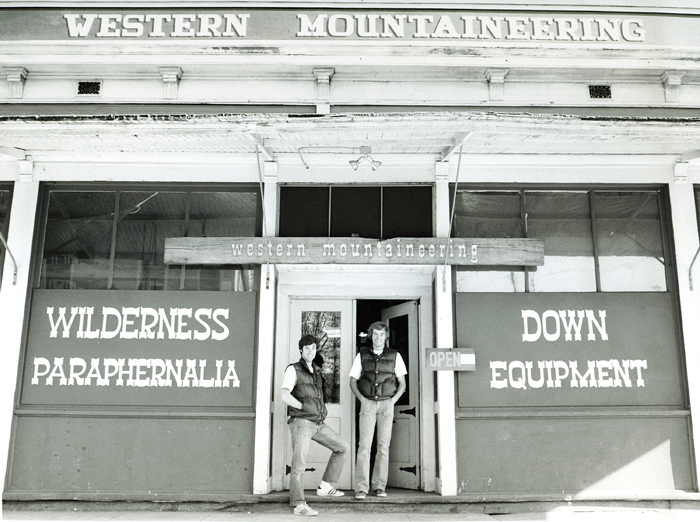 Founders Gary Schaezlein and Jeff Jones in front of their retail storefront in the early 70s. Sewing Supervisor Juana Barrajas started working for Western Mountaineering at the same time as Peterson. When her kids were young, Schaezlein would let her leave the floor to take them to school or pick them up. “I’m so grateful they let me take care of my kids while I was working here and raise my family and still hold down a job,” she explains. “It’s not a lot of money, but it’s the way they treat workers that keeps me here.” Half a dozen people have stayed with the company for over two decades, including her sister-in-law. There’s not a lot of turn-over. “Once we train somebody, we like to keep them,” explains Peterson. Meticulous attention to detail insures consistent high quality. Western Mountaineering uses 400 thread count, while many other companies settle for 250. They make sure the fabric is balanced, meaning it has the same number of threads on the warp and the weft. Most stock fabrics are unbalanced; it’s cheaper to produce fabric that has more threads on the warp so you can run the weft through quicker. Western Mountaineering also carefully monitors calendaring—the speed, heat and pressure of two enormous metal rollers that all fabric is run through after weaving. 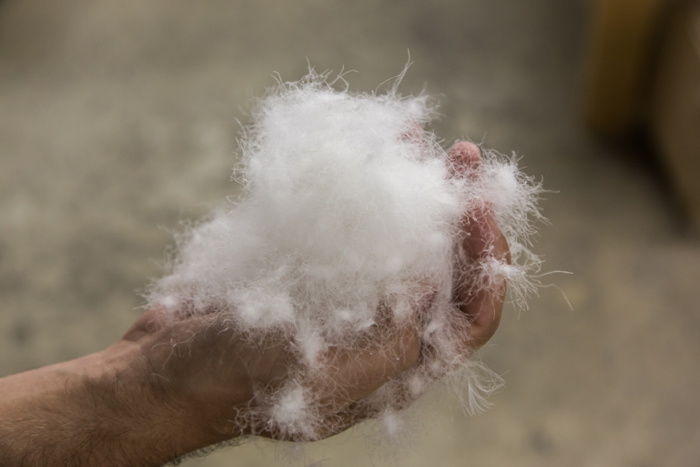 Calendaring and balanced thread count impact how downproof fabric is. Down can also leak through stitches, so Western Mountaineering double stitches nearly everything, and offsets the seams to reduce leakage. They hot cut the fabric, which cauterizes the edges to ensure they won’t fray. They buy all their down rated at 900 fill power, but sell it at 850. “They’ve changed the standards for measuring down so much, we want to make sure our customers are happy with our product,” explains Schaezlein. They source their down from a factory in Poland where the geese can roam the property’s meadows and ponds freely. The geese are raised for breeding, not meat, so they have a life expectancy of 4-6 years, as opposed to 30-40 weeks. Older ducks and geese naturally lose their down when they molt, and that fluff can be vacuumed up from nesting sites (they clean it, of course!) instead of being live plucked. All that attention to detail takes time; Western Mountaineering’s simplest bag takes about two hours to make and the most complex bag takes about eight. 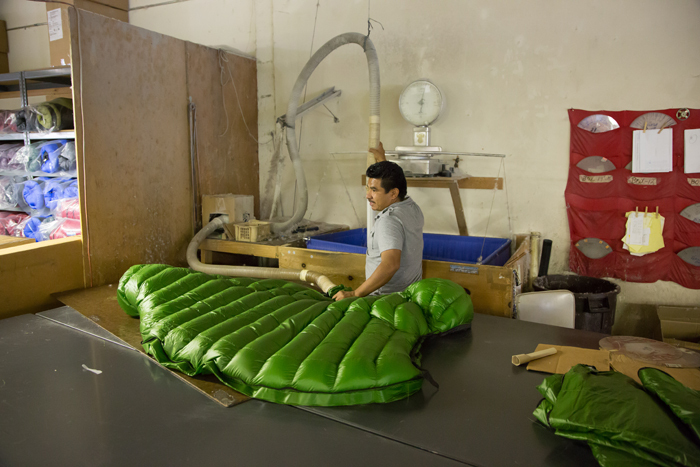 “We could make a sleeping bag in half the time, but it wouldn’t be as good of a sleeping bag,” explains Peterson. A sleeping bag being baffled; a handful of the high quality goose down that makes Western Mountaineering products so light and warm. Group photo of the Western Mountaineering team in recent years in front of the current factory. A sleeping bag being baffled. 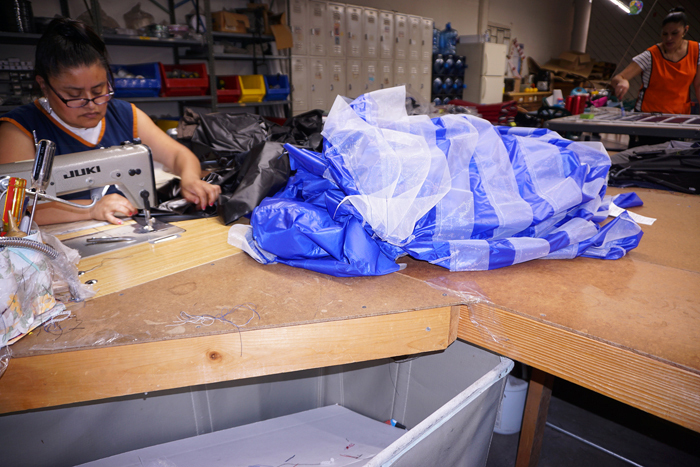 A Versalite bag being filled at the Western Mountaineering factory.